Virtual Hangout: NWS President and CEO Howard Herring leads a conversation on entrepreneurship, training and creative thinking in classical music, as well as what experiences led him to a position as the CEO of an orchestra. NWS Bass Fellow Nathan Lutz and Oboe Fellow Kevin Pearl also help guide the discussion. Howard Herring is a native of Oklahoma, a pianist by training, and now President and CEO of the New World Symphony. 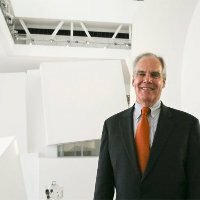 In 1986, he became executive director of the Caramoor Music Festival, leading that institution through the establishment of an endowment and the creation of two programs; Rising Stars/Caramoor Virtuosi and Bel Canto at Caramoor. He assumed leadership at the New World Symphony in 2001 with the charge of revitalizing the institution’s national and international profile and marshaling the forces necessary to create a facility to support the institutions future. In January 2011, New World Symphony opened a musical laboratory designed by Frank Gehry, on time and on budget. The program-driven building was designed to further the education of its Fellows, explore digital technology, serve the Miami community, and establish the New World Symphony as a crossroads of Western musical thought.